Post-recession conditions have brought increasing costs and complexities for home builders, often with entry-level buyers and attainability left behind. The demand from multiple market segments for unique product types and walkable living may have been expected, but the shift happened more quickly than anticipated. As a result, many builders are scrambling to refine business plans and figure out what they can—and can’t—reasonably deliver. One answer lies in missing-middle housing: Duplexes, fourplexes, bungalow courts, and mansion apartments were an integral part of every neighborhood built in the early 20th century, yet few have been built in recent years. But builders in different parts of the U.S. are starting to add missing-middle types to their offerings to answer market demands and to differentiate themselves. Holmes Homes, one of the largest home builders in the Salt Lake City area, historically built primarily single-family detached homes but has started offering townhouses. Recently, the builder was finding it increasingly difficult to deliver attached and detached homes that the entry-level market could afford. “We needed to explore how missing-middle types could address this challenge,” says Spencer Holmes, VP of Holmes Homes. Townhouses in Daybreak’s Mews Collection, in South Jordan, Utah, reimagine the townhome, with a light-filled double-height great room (Photo: Courtesy Holmes Homes). In many markets, single-family detached housing has been pushed to its limits in terms of density and yield. What’s next? Missing-middle types afford both attainability not possible with typical product types, and also respond to a common buyer demand: offering something different and unique. Missing-middle types allow builders to attract not just entry-level buyers, but those looking for smaller, higher-quality units as well. Surveys show that nearly 50 percent of all market segments want walkable living, even if it means living in smaller attached units. Builders most successful at reaching this market have been willing to offer duplexes, fourplexes, bungalow courts, and mansion apartments, being selective about where they build. But there’s some confusion about what walkability means. It’s more than putting on your sweats to go for a power walk. Walkability refers to the ability to walk down the street to a coffee shop or bar, or to a small office space that you’ve chosen to rent for your business. Walkability means being able to park your car on Friday at the end of the day, stroll with your family to a restaurant, and not have to get back into your car again until the Monday commute. But not every place can achieve a Walk Score of 90. (The Walk Score public-access walkability index measures the walkability of any U.S. address on a scale of 0 to 100.) If walkability is going to work, it has to be considered along the 50-to-100-point Walk Score spectrum, where 50 is “somewhat walkable” and 90 to 100 is a “walker’s paradise.” Every point counts: Based on more than 1 million homes sold between January 2014 and April 2016, real estate broker Redfin (which owns Walk Score) found that one Walk Score point can increase the price of a home by an average of $3,250, or 0.9 percent. In part, missing-middle housing helps achieve this walkability by increasing average densities to 16 dwelling units per acre minimum, ideally—the point where neighborhood-serving amenities become viable. Missing-middle housing types are house-scale and compatible in form. An assortment within the same block offers visual variety, a mix of residents, and the option to scale up or down—and stay in the neighborhood (Illustration: Opticos Design). There are challenges, to be sure: zoning, street design, NIMBY reactions to anything that’s not single-family, and a scarcity of well-placed lots. Look for communities that have adopted form-based coding to enable a broader mix of the missing-middle types and have often addressed parking and street design challenges as well. Places across the country as diverse as Beaufort County, S.C., and cities such as Cincinnati, and Mesa, Ariz., have adopted regulations to allow for the missing middle. Missing-middle housing typically starts at 650 square feet and tops out at 1,000 square feet. 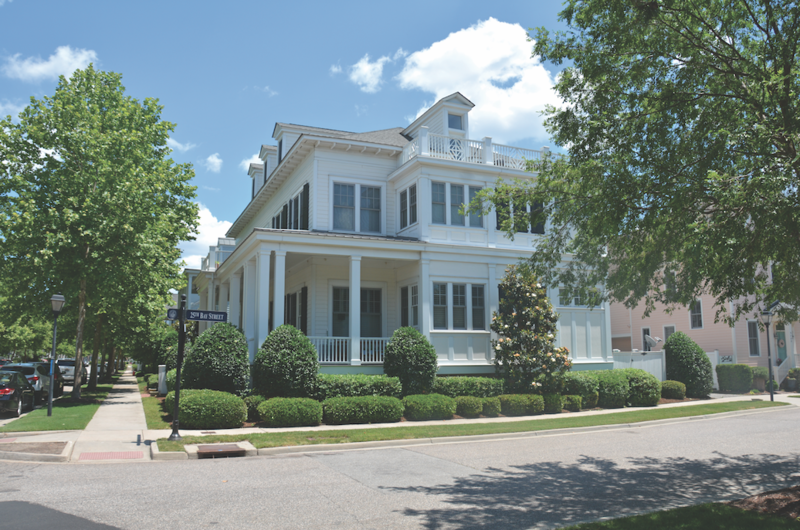 East Beach Fourplex, in Norfolk, Va., by Brown Design Studio, contains four mansion apartments (Photo: Jeremy Sommer). Increased density isn’t meant to force buyers to forgo a car. Instead, it offers choices to the growing number of households that live a less auto-dependent life and no longer need two or three parking spaces. But for missing-middle housing options to work well, site plans and designs can’t be parking-driven. A project with all three-story attached or slightly detached units with a ground floor that’s mostly parking isn’t a good solution: Parking dominates the ground level, lacks visual interest, and offers less choice for older buyers who prefer fewer stairs. As with walkability, parking needs to be considered along a spectrum. The more walkable an area, the more aggressive you can be with parking requirements and configurations. This may require a shift outside of your comfort zone, but it’s a great chance to fill an unmet need. Options include alley loading, clustered parking (common to cottage courts and pocket neighborhoods), parking pads instead of garages for one or more of the spaces per unit, non-direct access parking, and reduced on-site parking. The last choice assumes that on-street parking would be available near the units. And if you’re thinking that these ideas only work in mild climates, think again. “Our customers fall in love with the community and are willing to consider alternative parking arrangements to live here affordably,” says Tim Busse, town architect of The New Town at St. Charles, outside of St. Louis. Busse reports that the market has accepted parking options such as detached garages, covered and uncovered off-street parking pads, and even units without dedicated off-street parking. Making sure there’s a center within a new community reinforces the brand, provides a social space, and promotes walkability. But a large town center or strip mall isn’t required. Though you will need a long-term vision and a master plan, it’s often easiest to start simply, with something that feels local and genuine. A piece of land near the center of your community can be fenced off and picnic tables, a string of lights, and a fire pit added to the space. 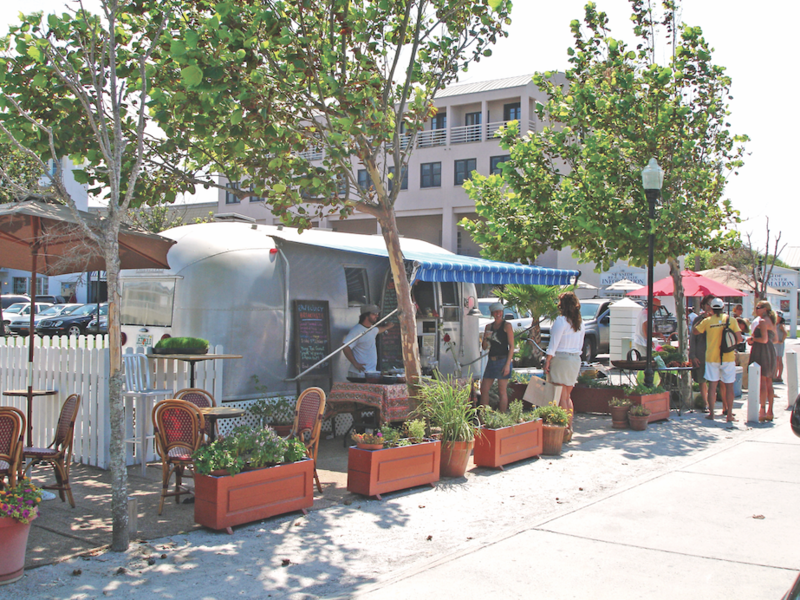 Finding local artisans, a couple of well-known food trucks that have proven their business model, or setting up an Airstream trailer from which a local vendor can serve beer and simple food, will give residents reasons to gather there. Ask these vendors to permanently locate at your center, or, in the case of the food trucks, to consider starting another truck to place there. This approach has been, and still is, being used to incubate the town center at Seaside, Fla., and in projects such as The New Town at St. Charles, near St. Louis, as well. You’ll offer just the kind of lively place that Millennials and Boomers are looking for—at low cost and low risk. What’s more, it strengthens your position and differentiates your brand from competitors. Make sure you know your market and can easily adapt. For example, one neighborhood beer garden, after realizing it was attracting families with young kids, created a sandbox in one corner of its outdoor patio so kids can safely play while parents have dinner and drinks with friends. Coffee shops have become the nerve centers for neighborhoods and towns all over the U.S. Instead of providing a community center and pool, consider subsidizing a small coffee shop. This can be supplemented by shared workspace and amenities such as the gym and sales/management offices, which can be integrated into small ground-floor flex spaces of live-work buildings. 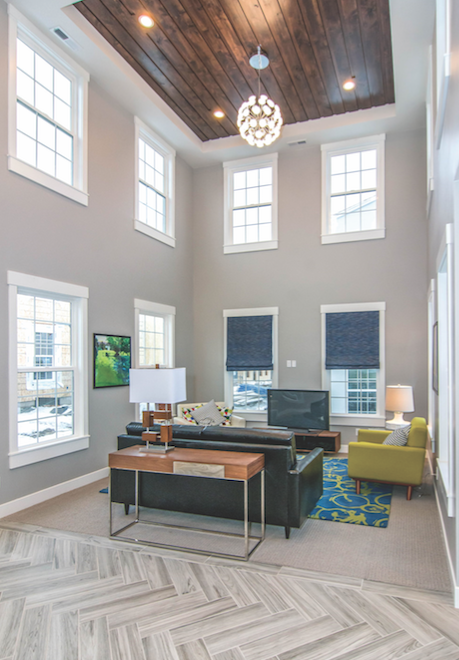 This use of flexible ground-floor live-work spaces has been done in communities such as South Main, in Buena Vista, Colo., and Kentlands, in Gaithersburg, Md. The downtown of Seaside, Fla., was incubated using temporary spaces like this Airstream trailer and small kiosks to create a sense of place and to test the market viability of business concepts (Photo: Opticos Design). The conventional way of selling lots and master planned communities has been to segregate housing by density, product type, size, or price point. 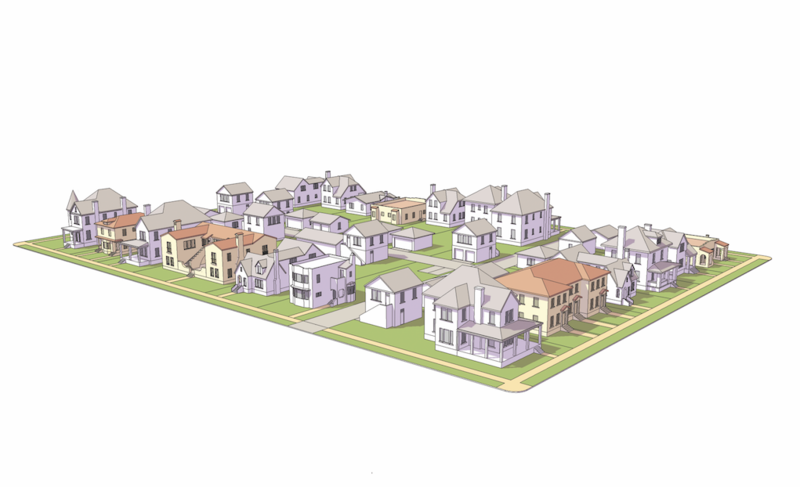 Effective missing-middle combines housing types of varied density, type, size, and price points within the same block. This works because the full range of types of housing is all house-scale and compatible in form, and can be integrated and mixed on the same block as single-­family detached homes. 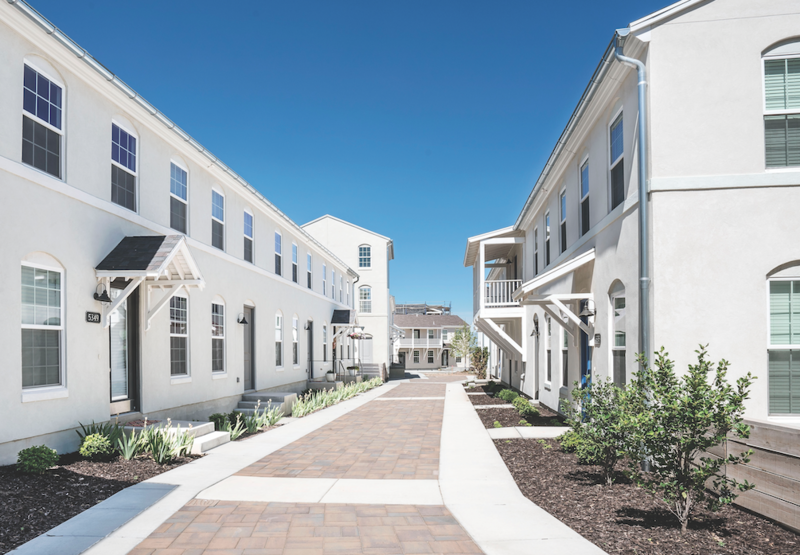 Steve Ebensberger, EVP of David Weekley Homes, in Tampa, Fla., points out that Weekley first varied product types on the same block in Celebration, Fla., almost 20 years ago, a strategy that would allow homeowners to stay in the same neighborhood as life changes occur, moving up or down. “With our rapidly aging population, this is a strong consideration for us,” he says. Daniel Parolek, AIA, is principal of Opticos Design, in Berkeley, Calif.